Keep Calm themed button badge. 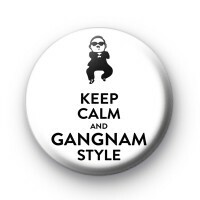 This is one of our favourite badges, it is black and white 1-inch badge with the text Keep Calm and Gangnam Style. If you loved the hit song a couple of years ago & can't resist doing the Gangnam dance whenever the song comes on the radio then you need this Gangnam Style, K-pop badge.